Back in the day, Boston's MBTA - commonly referred to as the "T," was one dollar and a bus ride was 80 cents. There was no difference in fares between peak and off-peak hours. Visitors from other cities were oftentimes shocked at how affordable it was to ride public transit. It’s still affordable compared to other cities, but the bus and T fares have risen considerably since then. And with the different types of fare classes and passes, it can be confusing to determine what you should pay – and how. To help avoid that confusion before you visit Boston, use this this breakdown of what you'll pay to ride the T – as well as recommendations for which type of pass gets you the best deal. What’s the Difference Between a CharlieCard and a CharlieTicket? CharlieCards are stored value. They’re a plastic card (like a credit card) that can be loaded and re-loaded or treated as a monthly pass. They’re a good option for commuters who regularly ride the T, buses and/or commuter rail. A CharlieTicket is a paper ticket, ideal for a single ride. Which Offers a Better Deal? Strictly going by price per ride, you’ll find it’s a cheaper option to get a CharlieCard. For example, it's $2.25 for a one-way CharlieCard ticket on the subway, but you pay an extra 50 cents if you use a one-time CharlieTicket or cash. Here are the latest prices if you’re commuting via Boston public transit. 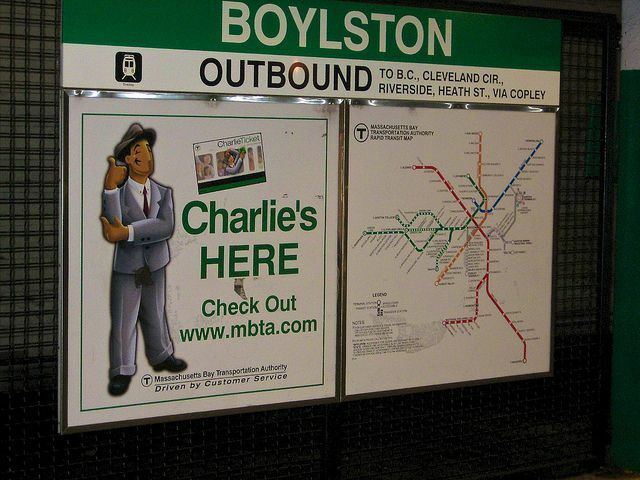 All prices are for adult one-way trips; to see fares for students and seniors, visit the MBTA website. Note: Commuter Rail and Ferry passes are separate and pricing varies depending on which zone you are traveling to/from. Best value: CharlieCard’s monthly pass saves $86 over the most-expensive single-ride option – nearly a 50% discount! The CharlieCard weekly pass comes in at nearly the same percentage of savings compared to the single-ride Charlie Ticket weekly cost equivalent. Best value: In this case, the CharlieCard monthly pass still comes out ahead – but this time by under $40 when compared to the CharlieTicket single rides used over the course of a month). When it comes down to it, the pass that's best for you depends on what you have planned for your trip. Is it going to be nice out during your stay? Boston is easy to walk from neighborhood to neighborhood, so you may end up doing so more than you think, as some MBTA stops are relatively close together. Plan out what you plan on doing and make the call from there.